The 10 Best RV Trips To Take In Missouri - Must See! From an arch that’s world famous, to Kansas City barbeque that’s almost as renowned, Missouri has quite a few bragging rights. Championship sports teams, great museums, and the hometown of a certain author who made fence-painting and river rafting into exciting adventures, there’s something for everyone in Missouri. If you’re looking for Missouri RV travel tips, check out a few of our favorite destinations below. A can’t-miss stop on your Missouri RV vacation is surely the Gateway Arch in St. Louis. 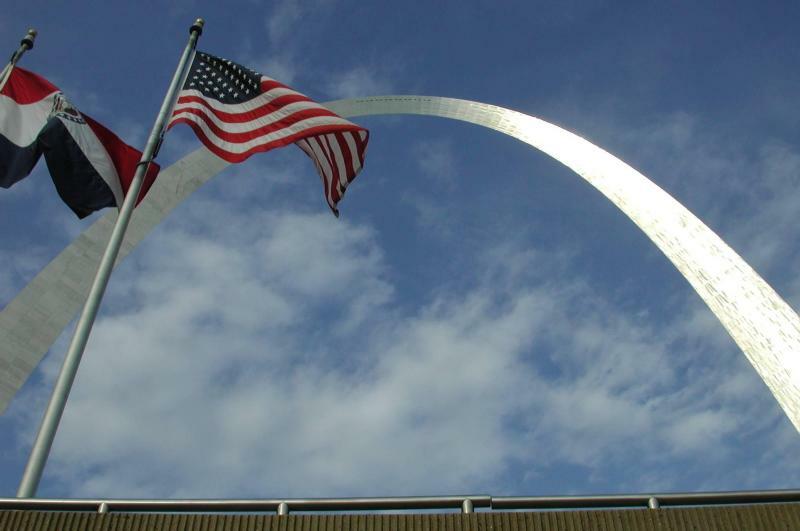 At 630 feet tall, the Arch is the tallest man-made monument in the Western hemisphere. It was built as a monument to the westward expansion of the United States and is a universally-recognized symbol for the city of St. Louis. It’s also the centerpiece of the Jefferson National Expansion Memorial. Take the Journey to the Top and ride an enclosed tram up the leg of the Arch to the Observation Deck. From the top, you get breathtaking views of St. Louis, and visitors on a clear day can see up the Mississippi River to Illinois…perhaps spotting five different bridges and a historic train trestle that connects Illinois to Missouri. You also have the option of an Arch Entry-Only ticket — there is a lot of construction going on around the museum at the bottom, so be sure and check the website before you go so you know exactly what options are available. You may also want to book your tickets online in advance. Also, while you’re there, take a Riverboat Cruise along the Mississippi. One-hour sightseeing cruises are narrated by the captain or a National Park Service ranger and help visitors understand the history of St. Louise and the role the river plays in modern times. There are also dinner cruises, a Sunday Brunch cruise, a lock ‘n dam cruise, and cruises on special days like Halloween and New Year’s Eve. The Casino Queen RV Park is just minutes from downtown and has pull-thru sites, full hookups, wifi, and a 24-hour shuttle to the Casino Queen and the MetroLink station. The St. Louis RV Park — the only RV park right in downtown St. Louis — has wifi access, pull-thru sites with full hookups, an RV convenience store, a meeting room, and a swimming pool. 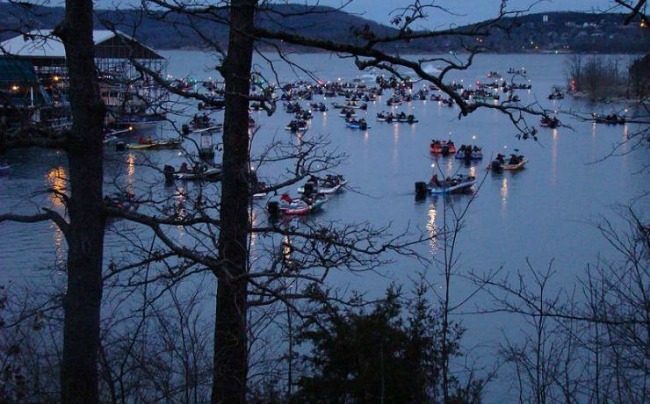 Table Rock Lake in the Missouri Ozarks has 800 miles of natural shoreline where visitors can go boating, fishing, parasailing, and even scuba diving. Rent a boat, a waverunner, or various other watercraft for an afternoon of fun on the lake. Visit Talking Rocks Cavern nearby and spend a day exploring underground in “Missouri’s Most Beautiful Cave.” You’ll see crystal formations along lighted paths 100 feet deep, and you’ll learn about the amazing geology of the area. You’ll also want to save some time for Dogwood Canyon Nature Park along the Missouri-Arkansas border, just south of Branson. You can hike or walk through the park, take a guided tram tour, go trout fishing, or even try horseback riding, all among some breathtaking scenery. 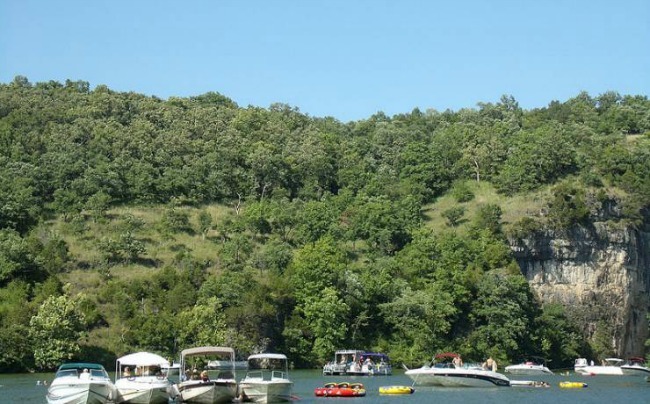 The Table Rock Lake RV Resort has full hookups with your choice of 30 or 50 amps, sunny and shaded RV sites, a private marina with boat slips and a ramp, and a covered outdoor barbeque pavilion. The Mill Creek Campground is a state park and has hot showers, a dump station, and access to a beach, a boat ramp, and a playground. 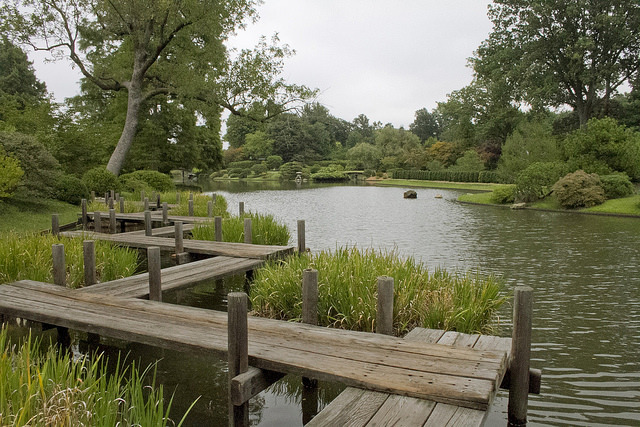 The Missouri Botanical Garden is the nation’s oldest botanical garden in continuous operation. Now, 153 years after the garden first opened, it’s a National Historic Landmark. Horticultural attractions like the Climatron® allow guests to wander through the first geodesic dome to be used as a conservatory. There are also cafes, garden shops, and tram tours. If you’re on a Missouri RV trip with kids, be sure to check out this information if they are avid Pokemon Go players — secret tips on how to catch those sneaky little guys! There is also a Children’s Garden…and the entire family should make it a point to visit the hugely popular Japanese Tea Garden. The botanical garden is in St. Louis, and there are a few St. Louis RV parks to choose from. The Casino Queen RV Park has pull-thru sites, full hookups, wifi, and a 24-hour shuttle to the Casino Queen and the MetroLink station. The St. Louis RV Park has wifi access, pull-thru sites with full hookups, an RV convenience store, a meeting room, and a swimming pool. Silver Dollar City in Branson has live music, amusement park rides, and demonstrating craftsmen. 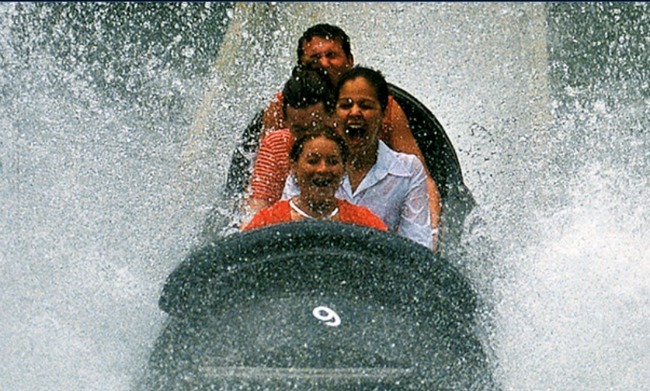 Try the wooden roller coaster that Amusement Today voted the Best New Ride of 2013. Descend almost 500 feet to Marvel Cave and see the Cathedral Room and learn about the geology and history of the area. Listen to live music and take in a Harlem Globetrotters show. Make sure to leave plenty of time to see the demonstrating craftsmen — the woodworker making wooden figures, and the glassblower creating beautiful works of art, and the candy maker making lovely, tasty goodies in front of you. Help kids get a sense of the work and effort that went into every aspect of early American life…and have a blast while you’re doing it. Camping is available at Silver Dollar City. The Wilderness Campground is close to the action but has scenic, private sites that aren’t too close to your neighbor. The campground offers free shuttle service to Silver Dollar City and has full hookups and pull-thru sites. Lakeview Campground has water, sewer, and electric hookups with 30 and 50 amp service, and free wifi. The Lake of the Ozarks is one of Missouri’s largest lakes and the perfect stop on the best RV trips in Missouri. Visitors can swim, fish, boat, hike along the shore, or just sit and relax among some amazing scenery. There are also some exciting mountain bike paths with beautiful and varied ecosystems to observe as you ride. You’ll find woodlands, sparkling streams that lead to the lake, and bluff-top views of the area. 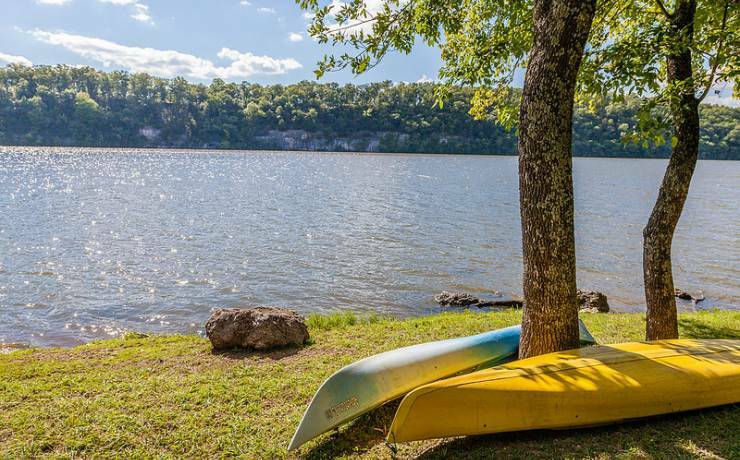 The lake has two swim beaches for families to enjoy, and also has boat rentals and paved boat ramps for those who bring their own watercraft. Also, make sure to visit Ozark Caverns and learn about the unique geology in the area, as well as the animals who live there. Keep an eye out of the blind grotto salamander, who sometimes makes a cameo appearance on cave tours! Price: Cavern Tours are $10 for adults, $8 for teens 13-17, $6 for children 6-12, and FREE for kids under 6. Camping is plentiful around Lake of the Ozarks. At Lake of the Ozarks State Park, sites have electric hookups, and there is a camp store near the entrance to the campground. Cross Creek RV Park has lakefront RV sites, showers, and a pool. Fishing and paddle boats are available for use at the camp as well. Ozark Trails RV Park and Campground has pull-thru sites, plenty of shade, picnic tables, and fire pits available for use. Missouri has over 130 wineries in all areas of the state. 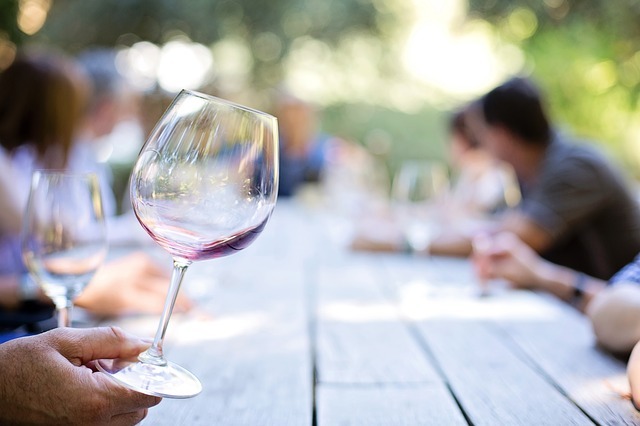 You can take a wine trail through several different areas of Missouri and experience the wineries of that region. If you follow the Missouri River, stop in at Cooper’s Oak Winery, where the wine cellar has replaced the historic Higbee jail cell. Also stop by Les Bourgeois Vineyard with its spectacular view of the Missouri River Valley, and Serenity Valley Winery where you can bring your own picnic and have a glass of Serenity Wine on the shores of Serene Lake. There is plenty of camping along the Missouri River — Cooper’s Landing Riverport Marina has campgrounds with 30 amp electric and water hookups and a dump station. The marina also offers dining, boat fuel, a boat dock, and a store nearby. Hanson Hills Campground has pull thru sites, electric hookups, and a dump station. There is also a swimming pool, playgrounds, and a fishing area. 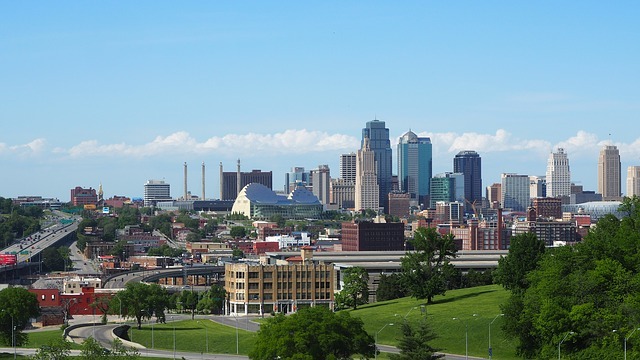 Kansas City should definitely be a stop on your Missouri RV trip itinerary! With top-performing sports teams, art museums, and a barbeque joint that was featured on Anthony Bourdin’s list of 13 places to eat before you die, there’s something for everyone to try. Depending on what season you visit Kansas City, you can catch a Royals baseball game or cheer on the Chiefs. Regardless of your favorite sport, Kansas City probably has a team you can root for. Afterward, you can spend a little quiet time perusing the Nelson-Atkins Museum of Art. The museum is known for its neoclassical architecture and includes collections of European and American paintings, Asian art, Native American art, and local Kansas City sculpture. While you’re in the city, be sure to stop by Joe’s Kansas City BBQ. It may have started at a gas station on a corner in Kansas City, but Joe’s is now an award-winning renowned barbeque joint with three locations and some mouth-watering barbeque. For fun, try the original location, still at the gas station. The Kansas City East/Oak Grove KOA is 15 miles from downtown Kansas City and has a saltwater pool, jump pad, mini golf and a playground. The Basswood Resort has four freshwater lakes and 155 full hookup sites with 30 and 50 amp electric, water, sewer hookups, cable TV, and wifi. The boyhood home of Mark Twain in Hannibal is an excellent Missouri RV trip idea for bibliophiles…or anyone who grew up loving Tom and Huck. 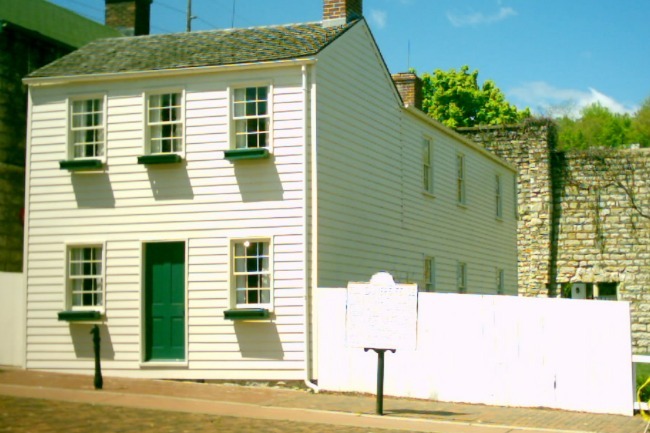 Visit the Mark Twain Boyhood Home & Museum and see his iconic white jacket among other artifacts from the author’s life. See his writing desk, chair, and typewriter and learn more about his time growing up in Missouri. Visit the Museum Gallery and see 15 original Norman Rockwell paintings, and book a Hannibal River Cruise on the Mark Twain Riverboat. Also, be sure to make time for the Mark Twain Cave — a cavern Samuel Clemens explored in his youth, and which inspired some of Tom Sawyer’s adventures in the book. If you’re not interested in tracing the author’s footsteps through his hometown, there are plenty of other activities to try in this quaint riverside town. The Mark Twain Cave Campground is near the fascinating geological feature that inspired some of Tom Sayer’s adventures. The campground features 90 sunny and shaded campsites. They have full hookups available, along with wifi, laundry facilities, and a small camp store. Bayview Campers Park in Palmyra is three miles north of Hannibal and has 23 acres, three lakes, and 140 campsites with water and electric. They have a shower house, an inground swimming pool, fishing in all three lakes on-site, and a playground. Ha Ha Tonka State Park is a stop on your Missouri RV road trip that should not be missed. Its history and geology make it a fascinating stop for both history and science buffs. The park has sinkholes, caves, a natural bridge, bluffs, and a spring. Ruins from a 20th century stone castle overlook the park and offer views of the Lake of the Ozarks and Ha Ha Tonka Spring. Visitors can walk the easy boardwalks or take more strenuous hikes through the park to learn about its history. Relax and picnic while taking in amazing views of the lake. Ozark Trails RV Park and Campground is nearby and has pull-thru sites, plenty of shade, picnic tables, and fire pits available for use. Green Mill Campground is in nearby Roach, Missouri and has dump stations, a boat dock and ramp, and fire pits for every site. 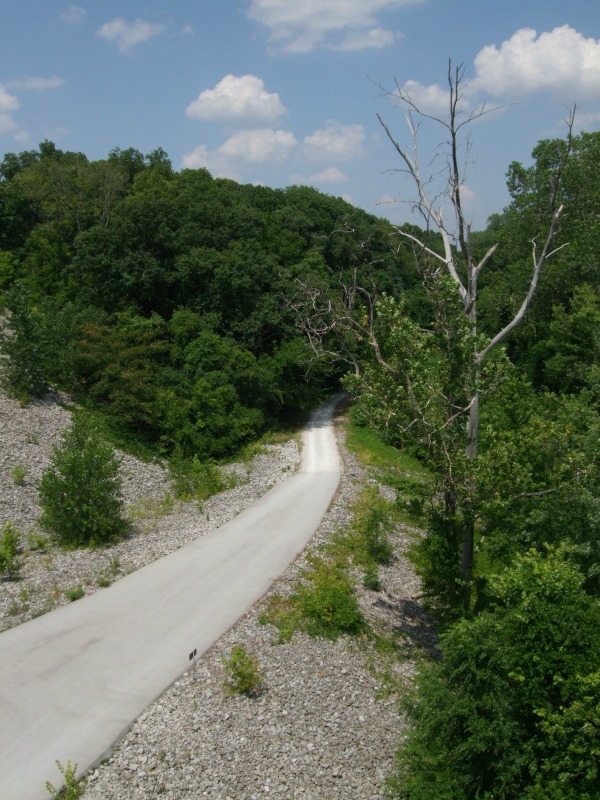 If you’re looking for Missouri RV travel tips, try investigating Katy Trail State Park. It’s the longest unbroken rail trail corridor in the country, stretching nearly 240 miles. It began as the Missouri-Kansas-Texas Railroad, and the corridor was part of the main line to St. Louis. It has since been converted into a trail for bicyclists, horseback riders, and hikers to meander through the state of Missouri and see its many varied people and environments. Walk a portion of the trail, or embark on a days-long journey to cover the trail from one end to the other — both will leave you with a new appreciation for the state. Cooper’s Landing Riverport Marina is along the Katy Trail and has with 30 amp electric and water hookups and a dump station. The marina also offers dining, boat fuel, a boat dock, and a store nearby. Cottonwoods RV Park has full hookups and wifi throughout the campground. Hopefully this Missouri RV trip planner has given you some excellent ideas to begin your own adventure in the state. This free Missouri RV travel guide is a great place to start — though if you’re looking for more suggestions, try one of these excellent campgrounds as a place to set yourself up for a few days. These Missouri RV parks are also wonderful choices during your RV adventure. RVshare can help you find the perfect Missouri RV rental as well. Regardless of where you choose to park your RV for the night, you’re guaranteed to have a wonderful time.